O Srila Prabhupada! I am singing your name. This service I will perform eternally. When will I receive your blessings? And when I become free from all of my own sinful desires? He who distributed devotional service to Krishna to the Western countries – how can I assist him? He is dancing in the association of Lord Gauranga in Navadvipa, and they are inundating the universe with the holy name of Krishna. My body and my mind are simply useless. Nevertheless, I am still trying to enjoy them. My body, intelligence, and words – please engage them in your service. You are the mercy incarnation of Nityananda Prabhu, and you are the topmost servant of Lord Krishna. The power of your preaching is piercing the covering of the universe. You are writing many books describing the glories of the Supreme Personality of Godhead, Sri Gauranga, and you are giving soothing relief to the entire human society. Let me simply distribute this knowledge to those who are suffering and unhappy. Then my life will be perfect. O lord, O Prabhupada, may you always be the object of my vision. Only the name of Krishna can destroy my pride and illusion. Although my mid an intelligence are contaminated by wicked inclinations, I meditate upon your lotus feet in causeless devotion. In the most holy land of Vrindavana, in Ramana Reti, at the lotus feet of Sri Krishna-Balarama, you are preaching the topmost knowledge of the Supreme Personality, Lord Krishna, who is the fountainhead of religion. O master of the senses, O my lord, Srila Prabhupada, let me offer my obeisances unto you. I offer my obeisances unto him, whose glances are full of mercy and who is the bestower of transcendental bliss. O renowned lord, protect me and kindly shower your compassion again and again. Let me offer my obeisances unto my Guru Maharaja, who is a disciple of Srila Bhaktisiddhanta, who is always calm and joyful, and who bears the name of Bhaktivedanta. The land of Bengal is worshipable by the whole world because Sri Caitanya performed His pastimes there. I offer my obeisances unto Srila Prabhupada, who is full of bliss. He is always in the ecstasy of Lord Gauranga and is therefore immersed in the lotus feet of Radha-Mukunda. The Bhagavad-gita is an ocean of Lord Krishna’s nectarean words, spoken (lit: obtainable) in eighteen chapters to assuage Arjuna’s lamentation. Giving up the strictures of all (other) principles of religion, (one should accept the Gita’s) central principle: (to serve) Krishna’s desire. Devotion to Krishna is the ultimate means (of spiritual success). The famous Srimad-Bhagavatam is Srila Vyasadeva’s most excellent work, the essence of all topmost scriptures. (In the heart of one who) hears its narrations about Krishna, pure loving devotion arises, as lamentation and illusion remain far away from the heart. Krishnadasa Kaviraja’s sublime work of poetry describing the history of Caitanya Mahaprabhu is a mine (of inspiration) for the Vaishnavas of the Gaudiya tradition. (By reading it) one comes to know the truth of Gauranga and attains the mood of being a servant of the servant; thus pure bhakti comes about for everyone. Rupa Gosvamis relishable work of the name Bhakti-rasamrita-sindhu shows the way to carefully analyze devotional mellows. It is an expanded progressive explanation of devotion in the stages of regulation, attachment, intense devotion, and pure love. The hearts of the devotees who read it become illuminated. Nitai Gauranga! Nitai Gauranga! Savior of the fallen, Nitai Gauranga! All glories to Prabhupada! All glories, all glories to Prabhupada! All glories to Prabhupada! All glories to Srila Prabhupada! From age to age, darkness increases progressively. But in this Kaliyuga, Nitai-Gaura deliver the fallen. In Satya-yuga, Treta-yuga and Dvapara-yuga, the Lord kills the demons. But in this Kali-yuga, Lord Gaura freely distributes Krishna-prema. His weapons were His extremely sweet unparalleled beauty and the congregational chanting of the Holy Names of Krishna. 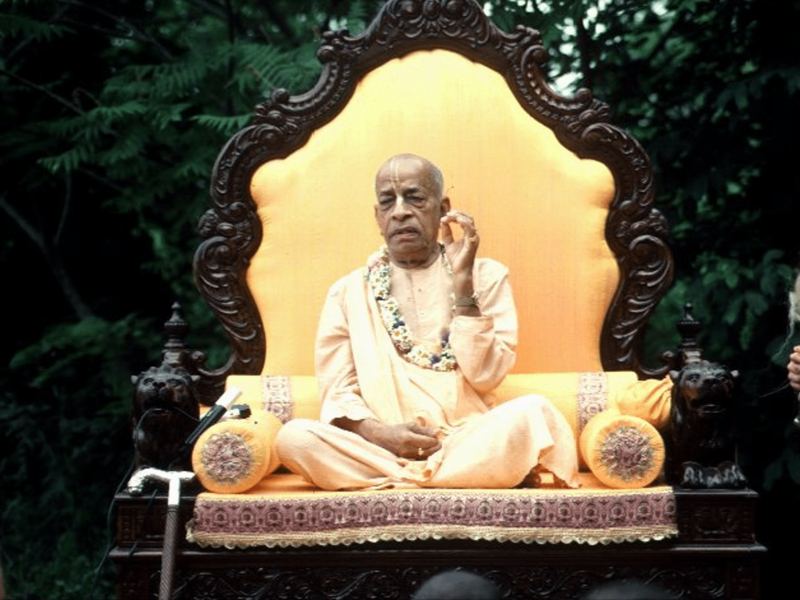 His force comprised His practice of the highest level of Vaisnava behavior, etiquette, and purity. But He disseminated love of Krishna only in India. To deliver people devoid of Krishna-bhakti in remote countries, Lord Gauranga sent a commander-in-chief devotee to the West. That commander-in-chief devotee (senapati-bhakta) was His Divine Grace Abhayacaranaravinda Bhaktivedanta Swami Srila Prabhupada. All glories to Srila Prabhupada! Lord Chaitanya said, “My name will be preached in every town and village throughout the whole world.” Prabhupada fulfilled this prediction, along with many others made by the Puranas, saintly persons, and the spiritual masters. 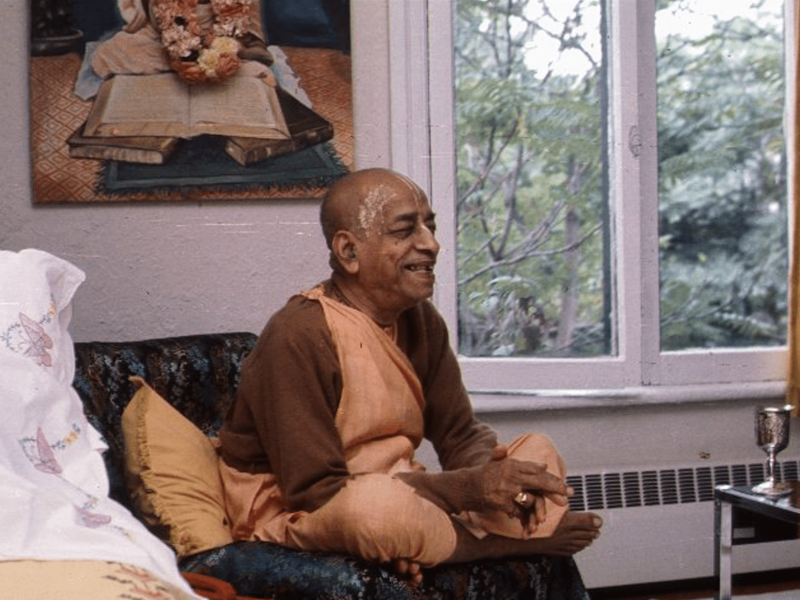 Prabhupada wrote books on the order of his guru, and the devotees have distributed those books in the hundreds of millions. 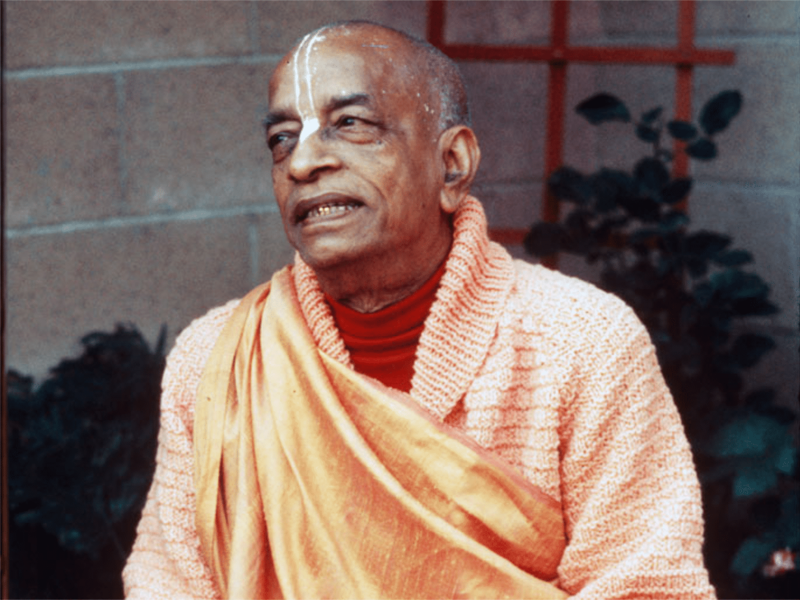 Thus he established that books are the basis of the Krishna consciousness movement. Discussion of the topics of Lord Krishna; the honoring of maha-prasada; the rendering of many kinds of devotional service; and the singing of the Holy Name accompanied by dancing and the playing of mrdangas, karatalas, and other musical instruments - all these took place wonderfully. Vaishnavas from all over the world come and circumambulate Navadvipa-dhama. They take the dust of the holy dhama on their heads and without any prejudice regarding caste, color, creed, or nationality, they embrace their Indian brothers and chant “Jaya Gaura, Jaya Gaura, Jaya Saci-nandana!” In this way they achieve transcendental unity in diversity. He formed the Governing Body Commission (GBC) as the ultimate managing authority for ISKCON and instructed everyone to serve cooperatively according to the GBC’s direction. Prabhupada infused Krishna consciousness throughout the world, and thus the victory flag of the ten-thousand-year golden age was hoisted. I serve the lotus feet of His Divine Grace A. C. Bhaktivedanta Swami Prabhupada. Because of his mercy, the delightful, aromatic, and cooling Malayan breeze of the service, pastimes, and message of Lord Krishnacandra is now moving over the Western countries. That breeze destroys the distressing heat of material existence and grants liberation [to the conditioned souls]. I offer respectful obeisances to His Divine Grace A. C. Bhaktivedanta Swami Prabhupada, who is igniting the fire of the sankirtana-yajna in the Western countries. That fire is the source of happiness and auspicious-ness for the living entities. I offer repeated respectful obeisances to my spiritual master, whose great mercy has caused the delightful honey of the holy name of Lord Krishna to be tasted by the tongues of those born in mleccha families. 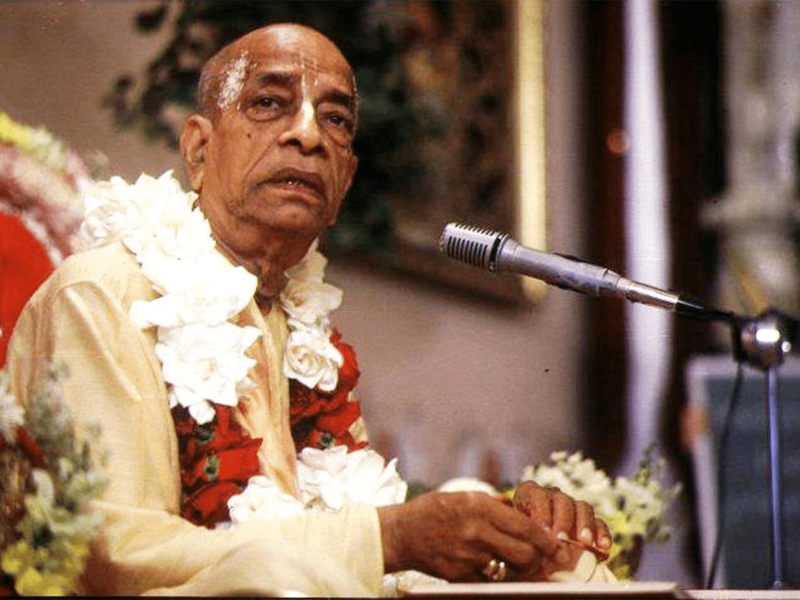 I repeatedly praise my spiritual master, His Divine Grace A. C. Bhaktivedanta Swami Prabhupada. Just see, he has mercifully brought Lord Jagannatha, whose smiling transcendental form is wonderfully blackish, and who is the master of all living entities, from the holy place of Kurukshetra to the countries of the fallen yavanas. I repeatedly offer respectful obeisances to His Divine Grace A. C. Bhaktivedanta Swami Prabhupada. With the sharp sword of logic and argument, he destroys the poisonous creepers of the Mayavada philosophy. He jubilantly and expertly plants the trees of devotional service to Lord Hari [in the hearts of the living entities]. 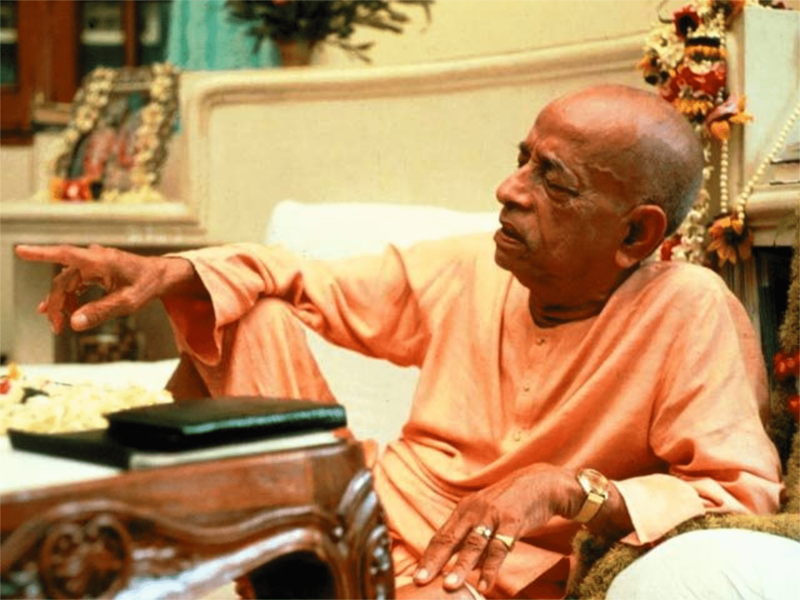 I offer respectful obeisances to His Divine Grace A. C. Bhaktivedanta Swami Prabhupada. Just see, by his merciful instructions he has turned the young people of the Western countries from bewildered jumping monkeys into devotees who understand the transcendental truths about devotional service to Lord Govinda. I offer repeated obeisances to His Divine Grace A. C. Bhaktivedanta Swami Prabhupada, who brought the delightful and regal mountain of Srimad-Bhagavatam to the Western countries. That eternal mountain is the best of the Puranas and the most delightful of all Vedic scriptures. It is full of rivers of nectar which are the prayers of the pure devotees, and it contains innumerable caves full of jewels which are the descriptions of the beauty of Krishna. That mountain has an exquisitely beautiful summit which is decorated with colorful gardens which are the auspicious pastimes of Lord Krishna, the son of Nanda Maharaja. 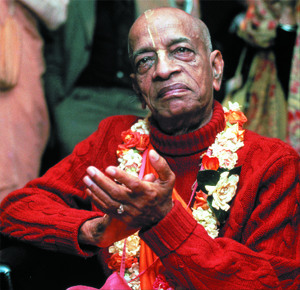 His Divine Grace A. C. Bhaktivedanta Swami Prabhupada is the leader of the paramahamsas. Because of him, the great banyan tree of the mercy of Lord Caitanya Mahaprabhu is now quickly covering the Western countries. That banyan tree is very fragrant, and it removes the burning sufferings of material existence. That tree delights the saintly devotees and creates great auspiciousness. With great respect I engage in the service of my saintly spiritual master, the leader of the devotees. He brought the famous, nectarean celestial Ganges River of the hearing and chanting of the glories of Lord Govinda from Vraja-pura to the Western countries. That greatly auspicious river nourishes the lotus flower of love of Krishna and kills the snakes of continued material existence. At every moment I bow down to His Divine Grace His Divine Grace A.C. Bhaktivedanta Swami Prabhupada, whose lotus feet are my only refuge. With great joy he reveals to us the divine teachings of Lord Gauranga, and as he is always engaged in spiritual welfare activities for the benefit of all living entities, he is our ever well-wisher. At every moment I bow down to His Divine Grace His Divine Grace A.C. Bhaktivedanta Swami Prabhupada, whose divine feet provide my only shelter from the rains of worldly illusion, as an umbrella is the sole refuge for a traveler in a storm. He is the revealer of the truth of Srimad-Bhagavatam in the Western world. He is the humble servant of Sri Bhaktisiddhanta Sarasvati Thakura, and his eyes are anointed with ecstatic love of God. At every moment I bow down to His Divine Grace His Divine Grace A.C. Bhaktivedanta Swami Prabhupada, whose lotus feet are my only shelter. He is empowered by Lord Nityananda to propagate the teachings of Lord Krishna in the form of the Bhagavata Purana. At every moment I bow down to His Divine Grace His Divine Grace A.C. Bhaktivedanta Swami Prabhupada, the umbrella of whose lotus feet is my sole refuge. He is a brilliant moon among the Gaudiya Vaishnavas and the very life and soul of devotees throughout the world. He is very dear to Lord Caitanya Mahaprabhu and is my divine lord and master. At every moment I bow down to His Divine Grace His Divine Grace A.C. Bhaktivedanta Swami Prabhupada, whose lotus feet are my only shelter. He is my ever well-wishing friend, spiritual father and master. He is the end-all and be-all of my life and is the exalted spiritual master of the entire world. At every moment I bow down to His Divine Grace His Divine Grace A.C. Bhaktivedanta Swami Prabhupada, the umbrella of whose lotus feet is my sole refuge and whose beautiful smiling gives joy to my heart. The places where he walks become holy sites of pilgrimage, and his lotus feet are to be taken shelter of by those who desire to attain the treasure of love of Godhead. At every moment I bow down to His Divine Grace His Divine Grace A.C. Bhaktivedanta Swami Prabhupada, whose lotus feet are my only shelter. By his infinite kindness, the divine name of Sri Krishna has been bestowed upon me, although I am truly a wretched and sinful living being. At every moment I bow down to His Divine Grace His Divine Grace A.C. Bhaktivedanta Swami Prabhupada, the umbrella of whose lotus feet is my sole refuge. As all the rivers of the world flow toward the great ocean, so his compassion and mercy flow toward all fallen souls. Let us continuously glorify His Divine Grace A.C. Bhaktivedanta Swami Prabhupada, by whose efforts the hearts of all living entities, which were pervaded by darkness, are becoming illumined with the brilliant and everlasting lamp of the teachings of Sri Caitanya Mahaprabhu, whose eternal abode is the holy dhama of Navadvipa. Taking the order of his spiritual master, Sri Srimad Bhaktisiddhanta Sarasvati, as his life, he showed his causeless mercy on the lowest born creatures, the inhabitants of the Western countries, by translating, publishing and distributing the auspicious treasure house of devotional literatures written by Srila Vyasadeva, Srila Krishnadasa Kaviraja and others. Let us, therefore, continuously glorify Srila Prabhupada. The last snare of nescience had been set in place by the Mayavadi “gurus” and “svamis,” who appeared like so many glow worms. When, however, the brilliant sun of Lord Govinda’s transcendental form began to illuminate the world, having been established, through the expert logic of Srila Prabhupada, as the Supreme Personality of Godhead, the glow worms were naturally eclipsed . Let us, therefore, continuously offer praise and adoration to His Divine Grace Srila Prabhupada. Let us glorify His Divine Grace A.C. Bhaktivedanta Swami Prabhupada. Because of his efforts, the pure and crystal-clear Ganges river of Srimad-Bhagavatam, the king of the Puranas, is now flowing all over the world. The pebbles in that river are the jewels which are the prayers of the pure devotees, and playing within its waters are the swans which are the pastimes of Lord Kesava. Let us glorify His Divine Grace A.C. Bhaktivedanta Swami Prabhupada, who planted the charming lotus feet of Sri Sri Radha and Krishna in hundreds of temples and thousands of hearts in this world. 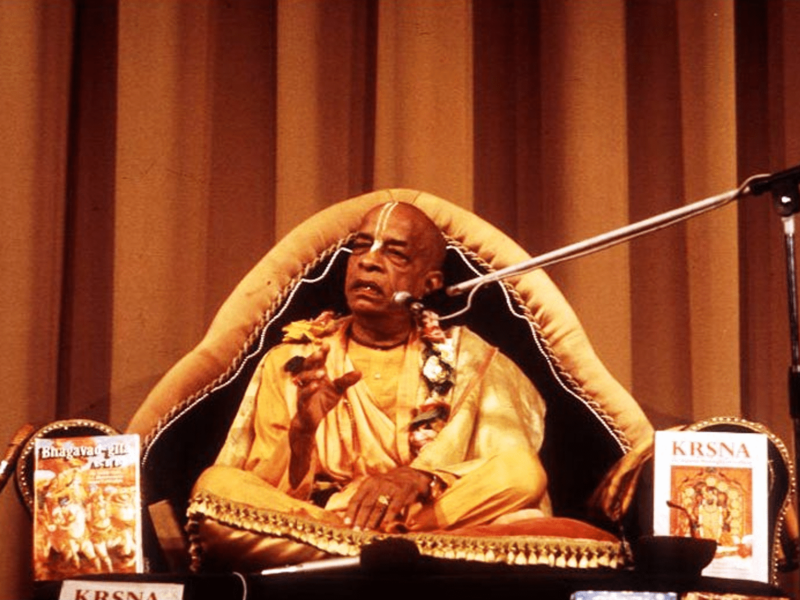 Seeing the fierce army of illusions put forward by the forces of Kali-yuga, Srila Prabhupada has released an unlimited shower of powerful arrows in the form of his books. In this way, truth is emerging as the victor. Let us, therefore, double and redouble our glorification of Srila Prabhupada. Let us glorify His Divine Grace A.C. Bhaktivedanta Swami Prabhupada. 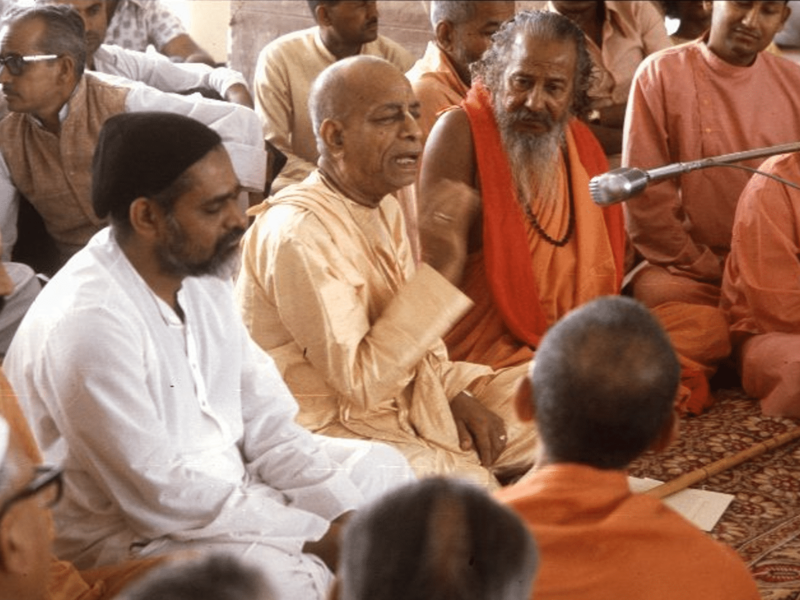 The desire tree of the International Society for Krishna Consciousness, whose many splendid fruits are different methods of distributing Lord Caitanya’s nectarean message, has been planted by him upon this earth. Let us forever glorify Srila Prabhupada, the unlimited ocean of mercy. With his body, mind, words and self, he has taken complete shelter of the son of Nanda Maharaja, Sri Krishna. Srila Prabhupada lives forever by his divine instructions, and his followers live with him. These eight verses describe, in small parts, the unlimited glories of His Divine Grace A.C. Bhaktivedanta Swami Prabhupada. The authors of these verses pray that all those who read them regularly and with the proper devotional spirit may become wonderfully empowered by the acaryas descended from Sri Caitanya Mahaprabhu to preach the message of Lord Krishna all over the world. 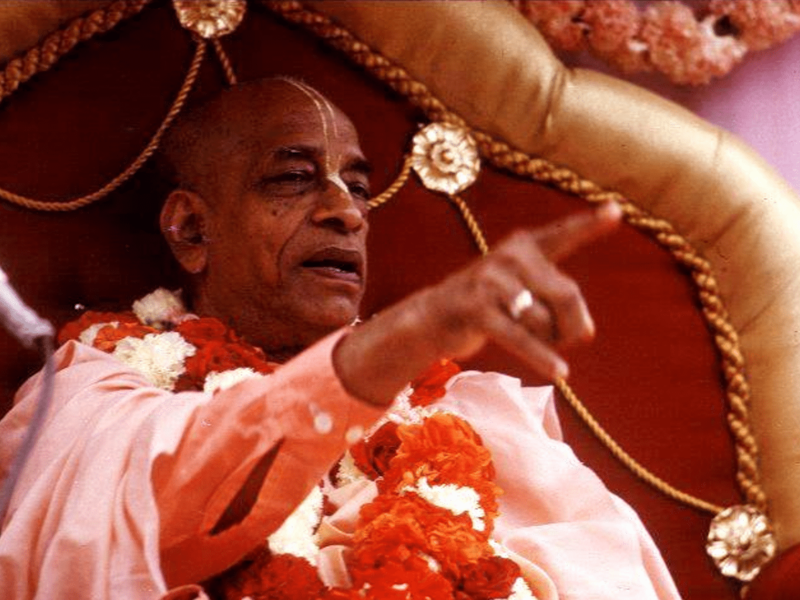 If Srila Prabhupada had not come, what would have happened? How could we have passed our lives? Who else would have distributed the unlimited mercy of Lord Nityananda and Lord Gauranga all over the world? Which other compassionate person would have endeavoured to deliver the miscreants , sinful, impersonalistic and voidistic people in the West? Who else would have come to distribute Harinama to them? Who else would have come forward to transform them into civilized beings? Bhagavad-gita, Srimad-Bhagavatam and Caitanya-caritamrta contain the essence of the nectarean mellows of love of Godhead. Who else would have explained these scriptures so clearly and beautifully? Who else would have tolerated all difficulties, and distributed Harinama with a pleasant heart? Who would have given us the dhamas such as Mayapur, Vrindavan and Jagannatha Puri? The teachings of Sri Caitanya Mahaprabhu constitute the greatest and most auspicious treasure. Who else would have engaged us in constantly practicing and preaching it? Sri Sri Nitai Gaura are desire trees of love of Godhead. Desiring a drop of Their mercy, Jayapataka's heart incessantly takes shelter of Your Divine grace. I offer my respectful obeisances to His Divine Grace A.C. Bhaktivedanta Swami Prabhupada. He is the saintly messenger of Sri Krishna and the merciful purifier and deliverer of the conditioned souls. He is a perfectly pure devotee of Lord Govindadeva. I offer my respectful obeisances to His Divine Grace A.C. Bhaktivedanta Swami Prabhupada. His mercy has released the incomparable golden lion of Lord Gaurasundar’s mercy, who leaps into the jungle of the Kali-yuga and chases away the various illusions of maya. I offer my respectful obeisances to His Divine Grace A.C. Bhaktivedanta Swami Prabhupada. Having crossed the salt-water ocean, he flooded the desertlike Western countries with the nectarean chanting of Sri Krishna’s holy name. I offer my respectful obeisances to His Divine Grace A.C. Bhaktivedanta Swami Prabhupada. He took the arani-sticks of hearing and chanting about Krishna and ignited the sacred fire of krishna-bhakti in this world. I offer my respectful obeisances to His Divine Grace A.C. Bhaktivedanta Swami Prabhupada. By describing the transcendental form of Lord Krishnacandra, he protects the people of this world from the horrible, faceless, formless calamity that is the impersonal conception of God. I offer my respectful obeisances to His Divine Grace A.C. Bhaktivedanta Swami Prabhupada. With the weapon of his transcendental purports he mercifully breaks the shackles of karma which bind the conditioned souls to this world of repeated birth and death. I offer my respectful obeisances to His Divine Grace A.C. Bhaktivedanta Swami Prabhupada. Compassionate on the distressed living entities wandering through various species forgetful of their real life, he leads them to the blissful lotus feet of the Supreme Personality of Godhead. I offer my respectful obeisances to His Divine Grace A.C. Bhaktivedanta Swami Prabhupada. He has mercifully changed the future destiny of his followers from what was once inauspicious to the superlative of auspiciousness. 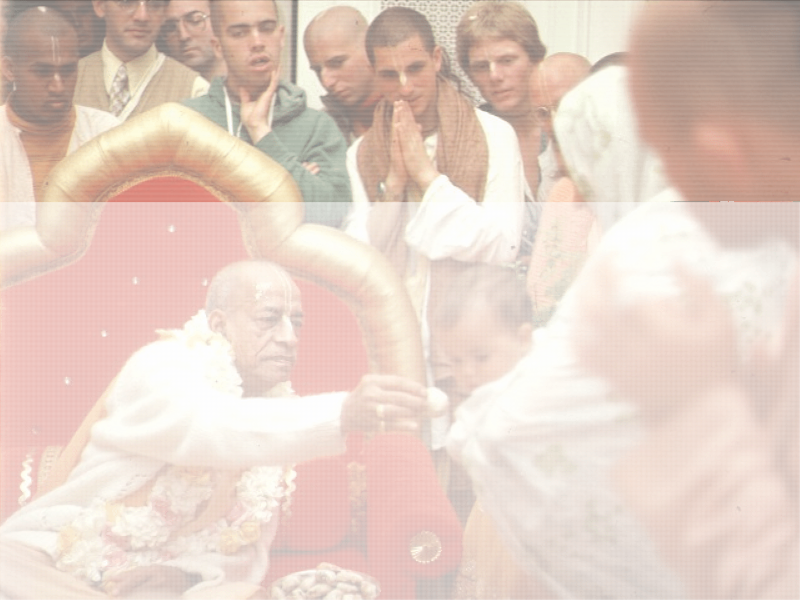 All glories to Srila Prabhupada’s childhood pastimes! All glories to his spreading the sankirtana movement of Sri Caitanya Mahaprabhu. All glories to his chanting of Hare Krishna kirtana through the streets of Calcutta. All glories to his always relishing the mellow of pure love of Lord Caitanya. All glories to Lord Jagannatha. 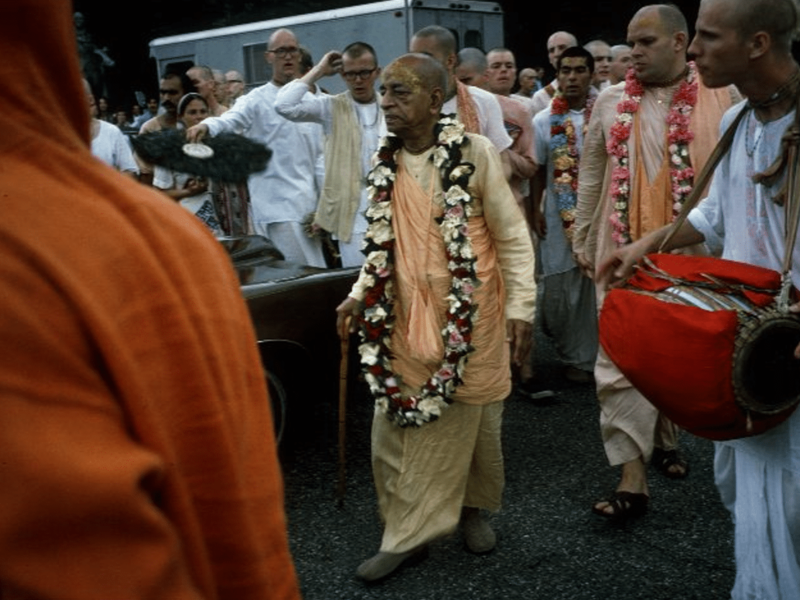 All glories to his blissful Ratha-yatra festival, which Srila Prabhupada began at the age of five. All glories to the Hare Krishna maha-mantra, which Srila Prabhupada chanted while leading Lord Jagannatha down Harrison Road in Calcutta. All glories to Srila Bhaktisiddhanta Sarasvati Thakura, the greatest among liberated souls. All glories to his disciple, Abhay Charanaravinda, who fearlessly and humbly acted as a servant of the servant of the lotus feet of Sri Krishna. All glories to Srila Prabhupada, the crest jewel of all brahmanas, who was honored for his pure devotion and Vedic scholarship with the title, Bhaktivedanta. All glories to the Srimad-Bhagavatam. All glories to Srila Prabhupada, the king of poets, whose commentaries on the Bhagavat are full of bhakti and his devotional ecstasies. All glories to Sri Jiva Gosvami’s beloved Deities of Radha-Damodara, who were so dear to Srila Prabhupada. All glories to Seva-kunja in Vrindavana, where Syamasundara serves Kisori. All glories to Sri Rupa Manjari, the constant companion of Srimati Radharani. All glories to Srila Prabhupada, the most wonderful Vaishnava saint. All glories to Jagat Guru Srila Prabhupada, who distributed Krishna consciousness all over the world and all over the universe. All glories to the most merciful Lords, Sri Nityananda Prabhu and Sri Gauranga Mahaprabhu. All glories to the Bhagavad-gita As It Is. All glories to this scripture (sastra), which establishes the proof about the Personality of Godhead Sri Krishna. All glories to Srila Prabhupada’s preaching mercy, which purifies and uplifts the fallen souls of Kali-yuga. All glories to the temples of Radha and Krishna that Srila Prabhupada opened in 108 different cities around the world. All glories to the blissful association of Krishna’s devotees found within these temples. All glories to the “big mridanga”—the global sound made by ISKCON’s continual distribution of Srila Prabhupada’s books to benefit mankind. All glories to Lord Krishna (Sri Kisora). All glories to Srimati Radharani (Sri Kisori), the names of the Deities in ISKCON Chicago. A devotee asked, “Why does Radharani’s name (Kisori) appear at the end, when everywhere else Her name comes before Krishna’s, as in Radha-Govinda, Radha-Syamasundara, and Radha-Damodara?” Srila Prabhupada smiled sweetly and said, “Why? Because we always save the best for last.” All glories to the holy names of Krishna. All glories to Srila Prabhupada’s BBT—the Bhaktivedanta Book Trust. All glories to Krishna-Balarama, the beloved Deities of Srila Prabhupada that he personally installed in ISKCON Vrindavana. All glories to the cowherd boys of Vrindavana. All glories to Srila Prabhupada. All glories to the wonderful and beautiful ISKCON—the International Society for Krishna Consciousness—which Srila Prabhupada founded to save humanity. All glories to Radha’s and Krishna’s eternally flowing transcendental pastimes. All glories to Sri Vrindavana Dhama. All glories to Srila Prabhupada, who eternally lives in Vrindavana, serving the lotus feet of Radha(Syama)-Syamasundara. All glories to Govardhana Hill. Giri-govardhana is the most beautiful and glorious of all mountains. Govardhana is simultaneously the Supreme Personality of Godhead Sri Krishna and also the best devotee of the Lord. All glories to the pure chanting of the holy names of Radha and Krishna. All glories to the desire to reside in Vraja-dhama. All glories to the mercy of the spiritual master. Only by receiving your mercy, Srila Prabhupada, and by purely chanting the holy names of Radha and Krishna can this fallen eternal servant of yours ever fulfill his desire to live eternally in Vrindavana.